Should We Be Buying Recycled Fashion? I get a small thrill whenever I flip over a product info tag and see those magic words. “Made From Recycled Materials”. Recycling isn’t the perfect solution. It is however one of many fantastic solutions in our flawed system of unsustainable consumption. The world is far from perfect, and it would be unfair to expect it to be. We tread in many grey areas, and sometimes our individual choices has to be less on being perfect and more about choosing between the lesser of two evils. I believe in the zero waste principles of Refuse, Reduce, and Reuse first before we purchase. In our choices, we make changes to our habits to reduce the waste created as much as possible. So the question is, should we be buying products made from recycled materials? Recycling has a carbon footprint that can often be overlooked; there is the energy used to transport recyclables to the facilities, the energy and resources used to recycle them and then ultimately to turn them into new products. But, no surprises here, it is still infinitely better than not recycling. Recycling significantly cuts down on the carbon footprint of producing new materials, conserves resources (i.e. water, energy, raw material) and reintroduces materials into the manufacturing process, which delays waste going into landfills, incinerated, or worse, mismanaged and polluting our waterways and the ocean. We are far from successfully tackling the continuous use of plastics and its waste, and all that waste has to go somewhere. So it’s important to create a demand for recycled materials in the first place. It’s simple economics; if there is a demand for recycled materials, that financially motivates businesses and people to provide the supply by recycling the seemingly endless source of plastic waste. Our purchasing choices are a signal to the businesses that say “Hey, we want a more responsible choice”. The fashion industry, called out repeatedly as one of the biggest polluting industries, can no longer afford to ignore the topic. The rise of sustainable fashion all over the world are businesses responding to the change in consumer sentiment. In fact, the big boys have jumped on board too. H&M Conscious, Nike GRIND, ASOS’ Made In Kenya, Vero Moda’s Aware, more and more fashion giants have their ears perked up with the growing consumer awareness. These big brands release capsule collections made with recycled materials or gradually supplant their supply chain with recycled materials. Yes, there are big gaps remaining and these moves are far from adequately addressing the problems in the supply chain. Most of these brands are still rife with unsustainable practices at its core. 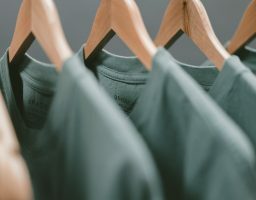 It will take a considerable overhaul to move away from the fast fashion business model, and these plays can look like acts of greenwashing to many. Their moves contribute to the growth of the sustainability movement and is a sign that we are slowly but surely shifting the supply of our fashion. More importantly, with their mainstream appeal, it now includes the uninitiated consumer into a ‘lesser evil’ and could possibly be one of the first touchstones for them to be introduced into the sustainability conversation. They’ll make sure you hear of it, and now some of those heavy marketing dollars of these fashion giants are spent on the topic of sustainability. It’s not perfect. But it’s a step in the right direction when big brands pull some of their weight in addressing change for the better. This doesn’t mean we get a free-for-all pass when it come to buying these products. They still come with a carbon footprint, though one that is less than a product made brand new as some of it is offset with the recycling involved. It would be counterproductive if we consumed more than ever before, for the sake of buying recycled. Buy an item made from new materials: The highest carbon footprint, preferably from more responsible brands. And throughout the product’s lifetime, we appreciate our belongings, care for them well, repair them when they’ve broken, re-gift/donate them if possible if there’s life left in them, and dispose/ recycle responsibly if not. It is about making a conscious decision on what would be a lower waste option and the lesser of two evils. Arguably, the lower waste option is to not buy at all. The ‘feel good’ element of products made from recycled materials is seductive, but the more subtle element here is how we learn to be honest with ourselves. To challenge our intentions to lead more responsible, eco-conscious lives, or even to admit to ourselves if a purchase we made is a “want” not a “need”. Do I truly need this, and did I make a ‘lower-waste’ choice? Or did I fall for clever marketing and the shiny lure of consumerism? It’s not about ending consumption, it’s about consuming mindfully. Don’t be afraid to second-guess the motivation behind your purchase. If we keep challenging our own views with a heart for learning, together, we can all be better stewards of the environment.